Robert Adzema is best know for his large sundial scluptures and as co-author of The Great Sundial Cutout Book. As he describes, "My sundials are abstract sculptures that measure the apparent motion of the sun throughout the day, the seasons and even the year. These mostly large, public works are carefully laid out, accurate both mathematically and geometrically, cast or fabricated in bronze, steel or stone and permanently set for their exact location. They are about sunlight and shadow." 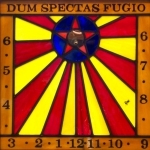 Visit his site for a sampling of his sundials, sculptures, and paintings. Altazimuth Arts, an enterprise established by Sara Schechner, well-know historian of science who is curator of Harvard's Collection of Historic Scientific Instruments. Schechner is also active in the Studio Art Quilt Associates, Quilters' Connection of Watertown MA, and member of Quinobeguin Quilters guild. As she explains, "Recent quilts are inspired by history and the night sky, the built environment wet within nature, and by the many-faceted meanings of tangible things." Alvin Sher is a sculptor from Connecticut who has "created sculptures using imaginary architectural elements for twenty-five years. The sculptures have dealt with mythic and scientific issues, using architectural forms as a vehicle. The subjects of the works range from temples and labyrinths to observatories and sundials; they are all metaphors for human curiosity and searching." 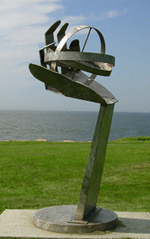 His stainless steel sculptures such as "Primum Mobile" illustrated here is beautiful, but not quite a sundial, or at least a useful sundial for the latitude of placement. His works are so close to being wonderful time-telling objects. Pete Swanstrom specializes in equatorial dials that use an analemmic gnomon to correct for the equation of time, creating a sundial that tells accurate clock time and date. He explains, "I call this the New Millennium sundial because its futuristic design achieves optimum accuracy later this century (around 2050 AD)." "The New Millennium sundial at left is a 6' stainless steel sculpture placed at the Herrett Center for Arts and Science, Observatory and Planetarium at the College of Southern Idaho. It indicates the time to within less than a minute, the date to the day, and even adjusts for Daylight Saving Time!" Swanstrom also designed a smaller version for home yards and gardens that he hopes to produce this year. Chet Roberts of Ohio makes horizontal sundials specifically for your location from cast aluminum. He designs the dials using computer aided drawing (CAD), and personalizes them with the inscription and background silhouette of your choice. Dials weigh about 3 pounds and are 10 inches in diameter. Please check his website for current pricing. 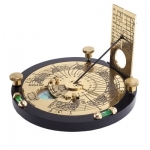 You receive the dial plate and dial gnomon, which are easily assembled into your personalized sundial. Four internet sites http://antiquesundials.com/ http://vintagesundial.com/ http://oldsundial.com/ and http://www.antique-scientific-instruments.com/ all lead to the same web location. Their home page states: "CAPTAINMADISON is a group of antique collectors, dealers, and liquidators, both purchasing and selling individual pieces and/or entire collections for over 42 years, specializing in all kinds of scientific instruments, including antique and vintage sundials (both pocket and desk), universal ring dials, equinoctial ring dials, compasses, astrolabes, drawing instruments, theodolites, telescopes, medical instruments, measuring devices, surveying instruments, navigation instruments, ... and scientific instruments, clocks, watches and time pieces, as well as books about all kinds of antique identification and collecting scientific instruments." Visit the website for email contact or write to Barry Lyons, 25 Jericho Run, Washington Crossing PA 18977 for more information. Artisan Industrials touches the world from a small but well equipped studio and workshop near Cincinnati Ohio USA. Artisan Industrials, formed by Jim Tallman, started with custom projects for private individuals and institutional clients. 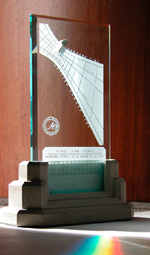 In 2002 Artisan Industrials introduced a new signature sundial designed by Jim Tallman, the beautiful glass "Spectra Sundial." All Spectra Sundials are individually handmade to the desired latitude, resulting in a personalized dial for "the person who has everything." These dials have been used by NASS as the trophy sundial for the Sawyer Dialing Prize. 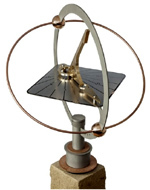 Over the years Artisan has shipped hundreds of custom Spectra sundials all over the world, earning the distinction that the sun never sets on the Spectra Sundial. 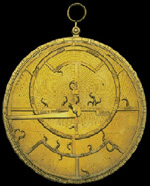 This is a wonderful site to explore the ancient world of astrolabes. James Morrison offers The Personal Astrolabe, accurately calculated for your latitude and longitude. As Morrison explains, "The purpose of The Personal Astrolabe is to draw people into the history of astronomy by offering a fully functional astrolabe at an affordable price. We feel strongly that cost should never be a barrier to education. We have shipped over 6,200 astrolabes to 60 countries since its introduction. We are proud that many, if not most, of the astrolabes we have made are the first ones ever made for their location. It is possible that more people have become familiar with astrolabes through The Personal Astrolabe and The Electric Astrolabe than all previous publications combined." 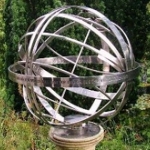 Brad Dillon is one of UKs leading craftsmen and sundialists, designing and manufacturing armillary spheres in bronze or stainless steel at his studio in rural Cornwall. These beautiful instruments are made to high standards and are elegant timekeeping devices that will serve as the focal point of a well crafted garden or sunny space. These sentinel timekeepers will serve for generations to come. 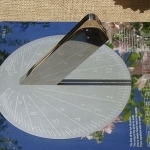 John Carmichael, award-winning American sundial designer and sundial maker, crafts exquisite accurate sundials of many types, shapes, sizes and materials. He also designs large public monumental sundials for people who want to make their own. His sundials show the precise time, date and other scientific functions if desired. The horizontal and analemmatic stone sundials are precision garden sundials for placement on a pedestal. These beautiful solar clocks are made from hand-carved stone with inlaid brass, stained glass, porcelain, or are even painted on walls. Intricate custom artwork is available. Working closely with each client, often by email, all sundials are custom-made to order using the sundial's location and each customer's particular tastes and requirements. The Sundial Owner's Manual and instructions are included. Expert packing and international shipping is available. David Brown has been making sundials since the early 1990s. 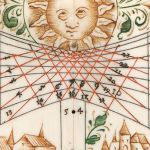 A lifelong interest in astronomy and navigation coalesced into a passion for sundial making. Since retiring as Head of Physics at Kingswood School, Bath UK, he has been able spend more time perfecting the craft of letter cutting and the art and science of designing sundials. David specializes in large installations like those he has created for Darwin College, Penshurst Place, the National Trust at Piles Mill, and Christ Church, Oxford. He was a founder member of the British Sundial Society and has won awards for his sundials. 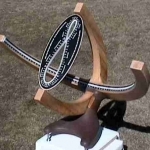 Rich Keele crafts unique portable horizontal sundials that tell both apparent solar time and local clock time compensating for latitude, time zone, longitude, daylight savings time and the equation of time. 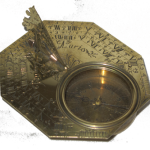 The Horus Sundial is completely self-contained including a compass with declination correction and spirit levels and leveling feet as well as a standard tripod fitting. Maps covering the entire 48 states are engraved in the brass dials and gnomon support to serve in making all corrections without the need for any external references. The Horus Sundial collapses flat for easy transport; a transport case and demagnetized ball head / tripod are also offered. 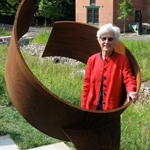 Kate Pond is a sculptor with workshop in Burlington, Vermont, "Corten steel is my material of choice. It rusts to a deep dark patina and light creates subtle changes in the soft velvety surface. Stainless steel is more dramatic and I finish the surfaces with signature swirls that reflect light in many directions. Concrete and stone boulders work well to mark the hours in large public sundials." Her latest work, illustrated here is "Come Light Visit Me," and perhaps her most well known, The World Sculpture Project with sundials in Japan, new Zealand, Norway and Hawaii is not finished. Each of the sculptures has a time capsule containing artwork from children from each site. The capsules will be opened in a ceremony in 2015. Public art is an extension of my love of drawing. My approach to a commission is to comb the history of the community and the site in order to connect with what is important and positive there. Making these aspects visible is my celebration. Public art is usually a group project involving fabricators, engineers, commissioning agencies and so on, all of which is intriguing and always a learning process. Designing an equatorial sundial is enjoyable because it can be both sculpture and “painting” as it provides the opportunity for artwork on the dial and base and can be of any proportions. The size and shape of the dial can vary in relation to the dimensions of the gnomon and either one can be the support or in the air. It is about making something that tracks the earth’s movement and is different every minute of the day. I have worked with youth-at-risk in the making of carved redwood sundials that stand at a 34 degree angle to the ground and are supported by one end of the steel gnomon. Hand-carved ceramic tiles around the base tell of their life stories. I would love to design another huge dial on a hill above a body of water. Alastair Hunter is an artist and engineer working in Edinburgh, Scotland. His Macmillan Hunter range of sundials includes simple yet beautiful dials for measuring the hours and reading the seasons. The sundials are strikingly modern. Alastair works mainly in metal - stainless steel is wonderful for reflecting color from its surroundings; brass is beautifully versatile and can be given a patina in color tints and shades; bronze has a lovely luster which darkens and weathers naturally. 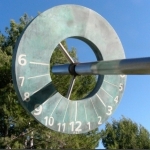 A Macmillan Hunter sundial is both a precision instrument and a work of contemporary sculpture. 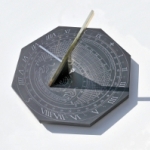 Piers creates contemporary sundials to commemorate important events for people, businesses, and communities. Each sundial is engineered to precise tolerances, making the dial to your exact latitude. The dials are made from marine-grade 10 mm stainless steel, so they are very durable, and will resist damage and weathering. The dials are designed for easy set up and plinths are also available. Cost of the dial includes engraving for motto, message, or scientific data such as the equation of time. The website provides step by step ordering instructions. Delivery is normally 4-6 weeks. Rafe Ropek has been a Public Artist for the past 20 years working from Ft. Collins, Colorado. His work is nation wide and his projects range from free standing sculpture to functional art such as benches, railings, transportation projects and sundials. Illustrated is an intriguing sundial entitled “Sun Shell”. This project combines a sundial and a band shell that can accommodate 30 or more people within the area. The gnomon is replaced with a circle that allows a beam of sunlight to mark the time on the ground. The work uses stainless steel bands supported on a colored concrete base inlaid with hour marks that extend from winter to summer solstice. Rafe Ropek designed and fabricated this work in 2004 for Aurora, Colorado. Gino Schiavone is a sundialist and public artist from Taos, New Mexico. "I had been given the perfect opportunity to combine craftsmanship, with my interests in astronomy, mathematics and art into a creative, magical object. With sundials I can wed my passion for metalwork, woodwork, photo etching, computer aided design & manufacturing, with the joy of hand forging. I love how properly executed sundials have a natural beauty and form that is driven by each dial’s unique location. The shadow, its only moving part, evokes in the observer a tangible sense that form is following function". 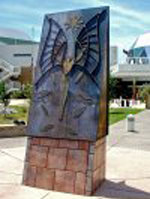 Illustrated is Gino Schiavone’s "Icarus Sundial", a monumental vertical sundial commissioned for the ¡Explora! Children’s Science Museum. The dial is copper with stone base.